Loom Bands are the biggest craze to hit Ballymena since we had a tamagotchi. Ballymena Today have enlisted Loom Band expert Rachel to help us find out all that we need to know about Rainbow Loom. 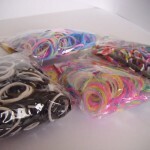 For those who don’t know, Rainbow Loom uses a plastic pegboard (called a Loom Kit, or a Loom) to turn lots of tiny colourful rubber bands into bracelets and other accessories. You can make almost anything out of them, from bracelets to little people figurines. And it’s not just the kids wearing them – certain celebrities have been seen wearing the famous Loom Bracelets. To support a charity, some people even made a coat of tiny little loom bands. Join the craze and see what you can do! Loom Bands are the latest craze – you can’t be in school for more than 5 seconds before you see someone wearing one. There are hundreds of different colour combinations and designs to try and YouTube is full of tutorials on how to make them. And it’s not just bracelets. 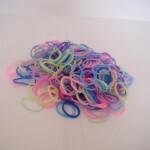 Loom bands can also be used to make necklaces, keychains, so-called “charms” and figurines. Lots of people make up their own designs and publish them on Facebook, Instagram, Pinterest, Twitter or YouTube, or just put the pictures up on the internet. 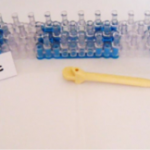 There have been “Elsa’s” from the movie Frozen, peacocks, mermaids, baskets, dogs, butterflies, and flowers – someone even made a Loom Kit out of blue and clear loom bands (see the picture above)! I have also made some things – a flip-flop, a ‘peace’ sign, an ice-cream, a pencil and a treble clef (for music). Some are a lot more challenging than others, but in the end, it will be so much more worth it when you see the finished product, and you will be able to say: “I made that!” So go for the extreme! It’s hard to know what you are capable of until you give it a try! I have swapped many ideas with other people, and I have also been told about new designs but mostly about bracelets. I just see people wearing some which I haven’t seen before and didn’t know about, and I just ask them what it is called, and then I look it up in YouTube afterwards to see how it is made. Stay tuned this week to find out more about my favourite Loom Band bracelets and the biggest Loom Band challenge around!